Sam Day's two first half tries were not enough to prevent Dewsbury suffering a narrow defeat to York in their opening Championship game. Dewsbury Rams surrendered a 16-point lead as York City Knights staged a dramatic fight back to claim victory at Tetley’s Stadium. The Rams appeared well on course for victory in their opening Betfred Championship game after producing a near faultless first half display only for York to turn the game with three tries in the space of nine second half minutes. 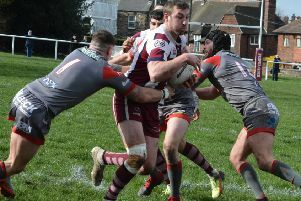 Even after the Knights had edged 18-16 ahead, Dewsbury looked to have won the game for a second time with Tom Garratt’s 71st minute try, only for the visitors to grab a dramatic late score to take the spoils. Dewsbury led after just four minutes as Simon Brown’s kick was knocked on close to the York line, gifting the Rams possession and after they drove the ball in, Sam Day forced his way over from acting half back and Paul Sykes added the conversion. York looked to have hit back when a neat runaround move ended with Connor Robinson nipping through a gap in the defence to seemingly score but he was pulled back for obstruction. The Rams produced a swift counter attack as they moved to the other end of the field and having driven play close, Day produced a neat grubber kick which he followed up to pounce for his second try, which Sykes converted. For much of the first half, the Rams defence repelled everything York could muster and Callum Field - on loan from Wigan Warriors - drove over the line but was held up between the posts. The game was littered with penalties - with 25 awarded in total - and the Rams took advantage when York were pulled up for an infringement and play was then marched 10 metres downfield for back chat. When the Knights were penalised for a third time in quick succession, Sykes landed his third goal to put the Rams 14-0 ahead. A York kick to in-goal was scooped dead for a drop out and soon after the Knights had a second try ruled out when Robinson sent a long pass out to winger Parry Whiteley, but as he strode over the line, play was brought back for a forward pass. More excellent Rams defence saw Brad Hey tackled into touch short of the try line and the home side were worthy of their 14-0 interval lead, which was extended soon after the interval with another Sykes penalty. Dan Igbinedion should have added a third Rams try but knocked on in the act of scoring before York staged a dramatic fight back. The Knights attacked on the back of a penalty with Kristian Brining and Robinson combining to send Graeme Horne crashing over at the side of the posts and Robinson converted. A Robinson break set up another York attack immediately after and Alex Brown failed to deal with a kick to the right which allowed winger Ash Robinson to gather and score, with Robinson converting. York almost scored again when Rob Worrincy spilled a kick but an attacker knocked on in the act of scoring and the Rams survived. The joy was short lived however, as Dewsbury were twice penalised in quick succession and York marched downfield. Kyle Trout was sin-binned after Dewsbury conceded a third penalty and moments later Jordan Jordan-Roberts was sent crashing over the line and Robinson converted to put the Knights 18-16 ahead. The 12-man Rams showed character to battle back and regained the lead when a penalty took them close and Sykes slipped a neat pass to Tom Garratt, who brushed off a weak tackle to plant the ball down between the posts. Sykes converted to edge Dewsbury back in front and they were soon back to a full quota when Trout returned from the sin-bin. Dewsbury looked to close the game out and strong goalline defence kept York out for five tackles, but on the last, Robinson kicked to the in goal area and full-back Matty Marsh won the race to pounce for a dramatic try. Robinson held his nerve to land the crucial conversion which edged the Knights 24-22 ahead as the game took another twist and with the last kick of the game, Robinson landed a long range penalty goal to seal victory and leave the Rams wonder how the game had slipped from their grasp. Dewsbury Rams: Morton; Worrincy, Igbinedion, Ryder, A Brown; Sykes, S Brown; Garratt, Day, Hargreaves, Walshaw, Knowles, Trout. Subs: Thomas, Field, Annakin, Sheriffe. York City Knights: Marsh; Robson, Bass, Hey, Whiteley; Cockayne, Robinson; Dixon, Jubb, Teanby, Jordan-Roberts, Slater, Horne. Subs: Brining, Stock, Blagbrough, Porter.